What is the difference between a home deep fat fryer and an air fryer? What are the differences between deep fried food and hot air fried food? Which one should you buy if you wish to cook and eat fried food at home? Well, you’ll find the answer after reading through this air fryer vs deep fryer article. 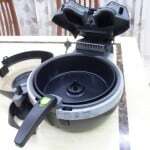 2 Healthy Fryer – Deep Fat Fryer Or Air Fryer? Frying with hot air requires no addition of oil or at the most, just a tablespoonful. On the other hand, deep fat frying involves a lot of oil. A home deep fryer needs about 1 – 4 quarts of oil. The deep fat turkey fryer will need about 3 – 5 gallons of oil. So, simple Maths – You get to save on oil with the air fryer. The used oil has to be disposed off. That is another problem to think about. Health experts do not recommend reusing used oil especially those with pieces of burnt food floating in the oil. 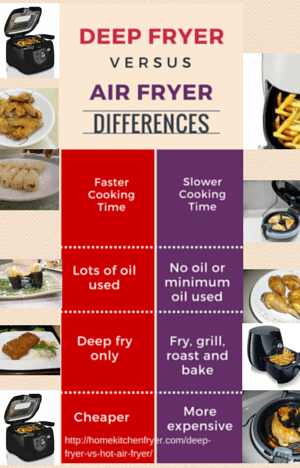 Healthy Fryer – Deep Fat Fryer Or Air Fryer? Using hot air to fry is certainly healthier than using hot oil. Air fried French fries contain 70 – 80% less fat than those deep fried (according to Philips brand air fryer). Whether you are on a low fat diet or otherwise, eating less fat is a healthier choice. When frying raw meat such as chicken, no oil is added in the air frying machine. In fact, excess oil drips out from the chicken during the cooking process. You end up with a chicken that has less fat content than before cooking. The slight crisp is still there in the skin and the chicken is moist and tender inside. Compared to air fried chicken, the deep fried ones have a nice crunchy skin, moist and tender flesh but a high fat content. There is less mess to clean up. With the hot air fryer, there is only the cooking basket or cooking pan and the drip pan to clean. Both are dishwasher safe. Even if cleaned by hand, it is still easy. Whatever food stuck to the basket or pan can be easily cleaned out after a good soak. This is not the case with the deep fryer. Oil vapor would have settled on the counter top and kitchen walls. You need to spend some time wiping these surfaces clean. Some of the more expensive deep fryer models come with splatter-free features but you will still get oil vapor droplets on your counter top even though less messy. Cleaning the hot oil pot is no simple task. Cleaning a very oily cooking pot is a hassle. The hot air cooker is easy and safe to use, it is covered with a lid during the cooking process. It cooks on its own without the need for you to stand besides it. When using the deep fat fryer, you need to stand in front of the hot oil to cook. Using the deep fryer involves more risk to the user. There are real cases of people getting scalded by hot oil and even cases of fire started because of hot oil cooking. Read about the dangers of deep fat frying here. Food getting burnt in the hot oil is a high possibility whereas in the air fryer you set the temperature and timer to cook the food to your taste. Very rare indeed to get food burnt when doing hot air frying. Since the air frying machine is safe and user-friendly, you can trust your teenager with it. You would certainly think twice if your teenager wants to use the deep fryer. The hot air deep fryer comes with multiple uses compared to the hot oil deep fryer. You can fry, grill, roast and bake in the versatile hot air cooker. You can only deep fry in the deep fryer. Simple Maths again – more economical in the long term as you get more uses out of the air fryer. Taste wise, the deep fried food has a more crunchy bite. This is because you can roll your food in wet batter before deep frying. In the air fryer, wet batter does not work well. The fast moving hot air would have resulted in the batter blown away from the food. You can lightly spray or brush a little bit of oil on the food for a more crispy taste though but you won’t get a strong crunch like deep fried food. Majority of customers’ comments have been positive on the taste of air fried food. Food taste moist and tender and of course delicious whether air fried or deep fried. The only difference would the degree of crunchiness of the skin and of course the fat content. So air fried food taste delicious minus the oily taste on your lips and mouth. Deep frying is faster compared to air frying. In deep frying, heat is very efficiently transferred from the hot oil to the food. Frozen potato wedges cook in about 15 minutes in the air cooker but takes only a few minutes in the hot oil fryer. However, 15 minutes is not too bad if you take into consideration the minimum amount of fat content in your air fried food. Besides cooking faster, you can also cook more food in the deep fryer at any one time compared to air fryer with its smaller cooking capacity. This would be a great advantage when having parties. However, where reheating of fried food is concerned, you can’t beat the airfryer. Just 10 minutes and you have your reheated food nice and crispy. 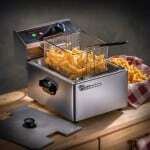 With the deep fryer, this would not be so practical, what with preparing the oil and then cleaning up the mess. Cooking just a small portion of food would also be more convenient and practical in the air fryer. There is no need to get ready a pot of hot oil. Just imagine, cleaning up the mess just for a small portion of French fries. The only criteria where the air fryer loses out would be in the pricing. 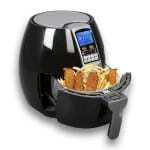 The deep fryer is highly affordable with prices starting from below $50 to under $200 for the more expensive models. The air fryers cost more with the majority brands in the $100 – $200 price range. The popular Philips hot air fryer brand has the large capacity model selling at above $300 on Amazon US. However, I would take into consideration that you can also bake, roast and grill in the air fryer besides frying. This means that you can save on a grill or maybe even an oven? So, have you settled on the home hot air fryer or the home deep fryer? Well, looks like you can’t have the best of every thing. So, it’s a matter of setting your priorities. If you are on a low fat diet, then you should really consider the low fat healthy air fryer. If you do not have to set a budget, getting the hot air multi-fryer with all its advantages over the deep fryer would surely appeal to you. If you have a busy work schedule day in day out, then the air fryer is your answer. Fast and hassle-free cooking as well as cleaning save precious time. If you stay in a small apartment with a small kitchen, then deep frying might not be a good option. If you’re a college student or the elderly doing your own cooking, the hot air cooker with its easy to use button controls is more suitable and safer too. However, if you do not have the budget for the air fryer or you really prefer the deep tasty crunch of deep fried food or perhaps you do not really eat a lot of deep fried food to justify buying the more expensive air fryer, then the deep fryer is still a good option. After all, deep frying at home is better than having fried fast food at the corner stores. At least, you can control the cooking oil when you deep fry at home. And of course, you have to take into consideration the cleaning up.